With two biopics set to hit the screens on this Republic day, people are having constant debates over which will overpower the other. 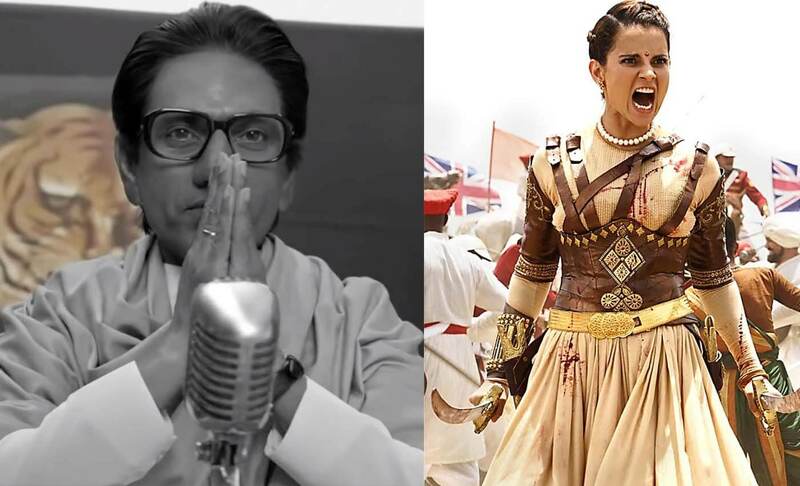 Slated to release on the 25h of January, Thackeray and Manikarnika: The Queen of Jhansi are both backed up with powerful star-cast where one has ace actor Nawazuddin Siddiqui and the latter has the queen of Bollywood Kangana Ranaut as the lead. Despite the clashing, many critics think that both the movies will remain unaffected by each other’s business. With his impeccable acting and unmatched talent, Nawazuddin Siddiqui is back on the screens and with a much bigger force this time as he will be seen playing one of the most powerful and revered leaders of Maharashtra, Bal Thackeray in the biopic named Thackeray. One look at the trailer and you can see Nawaz’s uncanny resemblance with the Shiv Sena founder, the actor donned his style of walking, talking, sitting and everything possible. Starting as a firebrand journalist to an influential political leader who played a major role in shaping the Marathi identity, Balasaheb still lives in the hearts and memories of Marathas. Although, ahead of its release, the movie was stuck into controversies that stated that the Censor Board reportedly asked for four dialogues and three cuts in the movie which apparently relate to the Babri Masjid demolition and few references to the South Indian community. Releasing in Hindi and Marathi with Nawaz in the lead, we will see Amrita Rao as Bal Thackeray’s wife Meena Tai Thackeray. Directed by Abhijit Panse, the film is written by Shiv Sena politician Sanjay Raut. Manikarnika, the warrior queen of India, is a historical figure who is known across the world for her valour and courage as she was the first woman in history to fight against the British and started the first war for Independence. Produced by Kamal Jain and Zee Studios, Manikarnika: The Queen of Jhansi is the story of a young Maratha girl, Manubai Tambe, who marries the king of Jhansi, Raja Gangadhar Rao. Post her husband’s death, the 22-year-old queen rules Jhansi with her formidable spirit and resists British Raj with her warrior skills, her efficiency with the sword and a strong team trained under her guidance, including a huge number of women. The queen got into the battlefield, dressed as a man, and fought a fierce battle with her enemies but was unfortunately killed in combat. Her life story and fight against the British is still an inspiring tale of bravery, valor and women’s strength that has inspired the countrymen and will continue to do so. The film has a stellar star cast which includes television actor Ankita Lokhande, veteran star Danny Denzongpa, Suresh Oberoi, Kulbhushan Kharbanda and Mohammed Zeeshan Ayyub among others and the film is expected to become the highest woman-led opener at the box office.